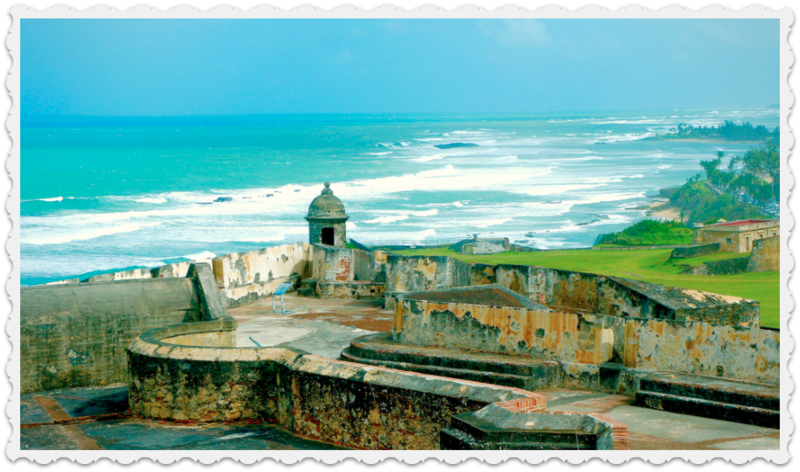 What better way to put our patriotism into practice than by helping fellow Americans in Puerto Rico whose lives have lately been devastated by hurricanes? Much as I pointed out earlier, Plato and the Nerd touches upon a ton of fundamental themes which have resonated with me. And doesn’t this whole business of interleaving, cascading themes (see the John Muir quote below) have a way of being “hitched to everything else in the universe“? Within the decidedly limited space and narrow borders delineated by an essay such as this one, I simply can’t do justice to splendid take of Plato and the Nerd on the whole business of “complementarity”; for a much fuller, engaging, and riveting treatment of “complementarity”, I invite you again to head over to your local, bricks-and-mortar bookstore—in fact, I strongly encourage you to patronize and support the vestige of the remaining bricks-and-mortar bookstores lest they, too, get overrun by the juggernaut of online bookstores and thereby go the way of the dodo. 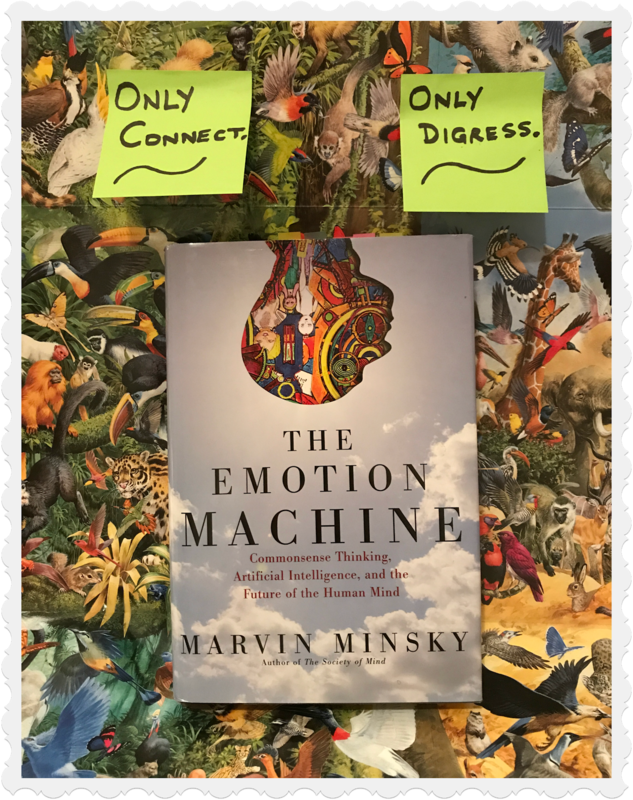 We are seeing the emergence of symbiotic coevolution, where the complementarity between humans and machines dominates over their competition. But quickly, that exploration of the Lisp dialect Clojure—as I revisited it, merely glancing at it ever-so-briefly—I found that Escher’s Drawing Hands lithograph had performed the signal service of adorning that essay which I had written back in the August of 2015. Now I see with some satisfaction that it seems to have found a kindred soul 👦 👧 in the refreshingly evocative cover of Edward’s Plato and the Nerd, woohoo! Narratives are the architecture of experience, the ever changing structure that gives it form. Without narrative, affect would be chaotic and rudderless, as shapeless as a collapsed tent; and without affect, narrative would be dry and meaningless (italics mine). At this moment, I can palpably sense all the kind, caretaker souls in our Programming Digressions reading community brimming with compassion for your blogger, sending their kind wishes my way 💕 reassuring me that it’s perfectly fine to get an education and have fun at the same time 👍 Thank you, I needed that! Passin’ by, movin’ straight ahead you knew it all. Soldier on, only you can do what must be done. You know, in some ways you’re a lot like me. You’re just a prisoner, and you’re tryin’ to break free. So what I’m really saying is simply this: The collage is the essay. There’s no time for us. There’s no place for us. I hasten to add a remark regarding the choice of words for the name of this essay section (i.e. “The Collage (The Guts Of This Essay)”). As I deliberated on a choice—foremost in my mind being the thought whether the signposting was decent enough for you all, my friends in the Programming Digressions community—I couldn’t help but think to a hilarious piece I had read in an especially entertaining issue of the magazine Harvard Lampoon during my graduate school days at Texas A&M University. What?! So what do we do, simply amuse ourselves with sachet? Dare I ask if all that was merely a mirage? Are you suggesting that our entry to further enlightenment is barred? Anyhow… Hmm… A rather bleak picture painted above by Poe, wouldn’t you say, Joe? Maybe he had watched the classic, dystopian movie The Matrix one time too many 🙈 That would explain, wouldn’t you say, Jane? 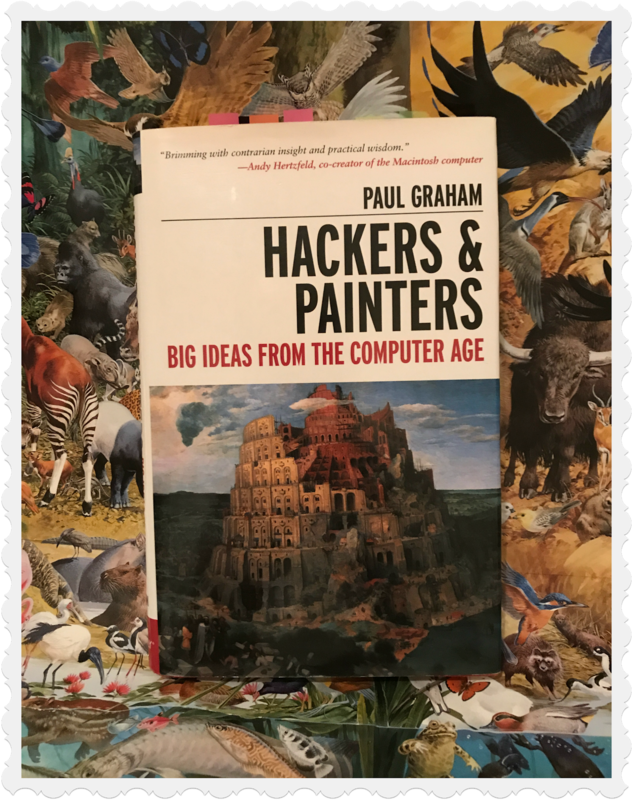 I was reminded of the message in the pages of Hackers & Painters: Big Ideas from the Computer Age (O’Reilly Media) by Paul Graham by how Plato And The Nerd takes on ideas that are at least as weighty—and probably far more consequential—as those in Hackers & Painters. When I finished grad school in computer science I went to art school to study painting. A lot of people seemed surprised that someone interested in computers would also be interested in painting. They seemed to think that hacking and painting were very different kinds of work—that hacking was cold, precise, and methodical, and that painting was the frenzied expression of some primal urge. Both of these images are wrong. Hacking and painting have a lot in common. In fact, of all the different types of people I’ve known, hackers and painters are among the most alike. What hackers and painters have in common is that they’re both makers. Along with composers, architects, and writers, what hackers and painters are trying to do is make good things. They’re not doing research per se, though if in the course of trying to make good things they discover some new technique, so much the better (italics mine). But more fundamentally, the title puts into opposition the notion that knowledge, and hence technology, consists of Platonic Ideals that exist independent of humans and is discovered by humans, and an opposing notion that humans create rather than discover knowledge and technology. The nerd in the title is a creative force, subjective and even quirky, and not an objective miner of preexisting truths. I hope that through this book, I can change the public discourse so young people are more inclined to consider a career in engineering, and not just because of the job prospects. I am convinced that engineering is fundamentally a creative discipline, and the technical drudgery that prejudices many people is no more drudgery than found in any other creative discipline. Yes, hard work is required, but as a reward for that hard work, you can change the world (italics mine). 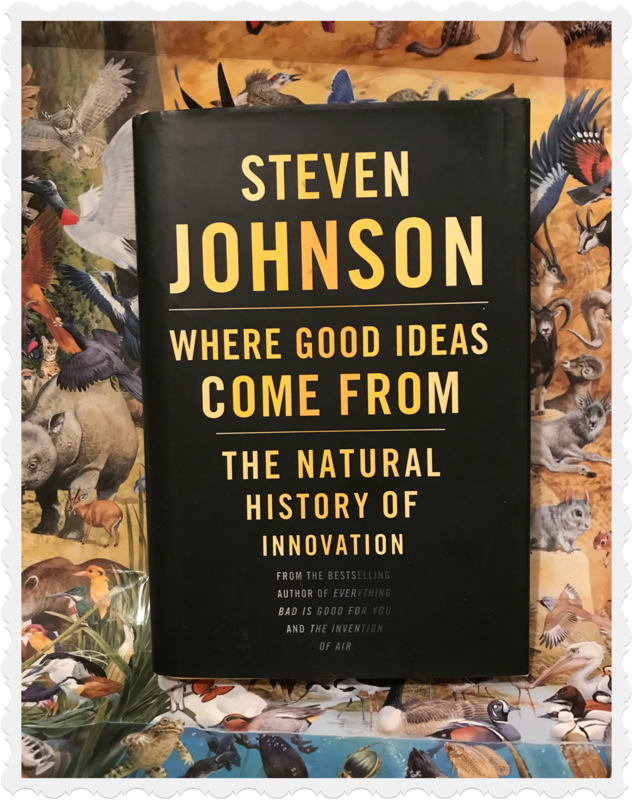 So I was reminded of the message in the pages of Where Good Ideas Come From: The Natural History of Innovation (Riverhead Books) by Steven Johnson by how Plato And The Nerd introduces the eminently reasonable idea of how “…technology is coevolving with humans, augmenting our own cognitive and physical capabilities, all the while enabling us to nurture, evolve, and propagate the technology.” (italics mine). Once we recognize that technology is fundamentally a creative enterprise and a partnership between man and machine, then the personalities and idiosyncrasies of the creators of any particular technology become important. We must not treat technologies as dry Platonic facts that have always existed in some other world, waiting to be discovered. 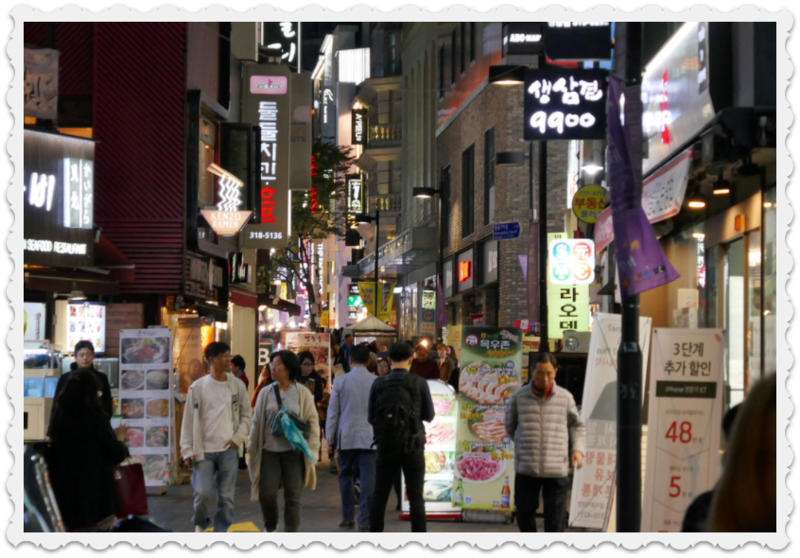 Instead, they are cultural, dynamic ideas, subject to fashion, politics, and human foibles. To me, this makes technology much more interesting… As cultural artifacts, technologies evolve through collective mutation, through design and invention, more than through discovery (italics mine). Science is a lot of high level theory and engineering is implementation and optimization. Engineers trained [sic] for Using tools, where Scientists are trained for Making them. 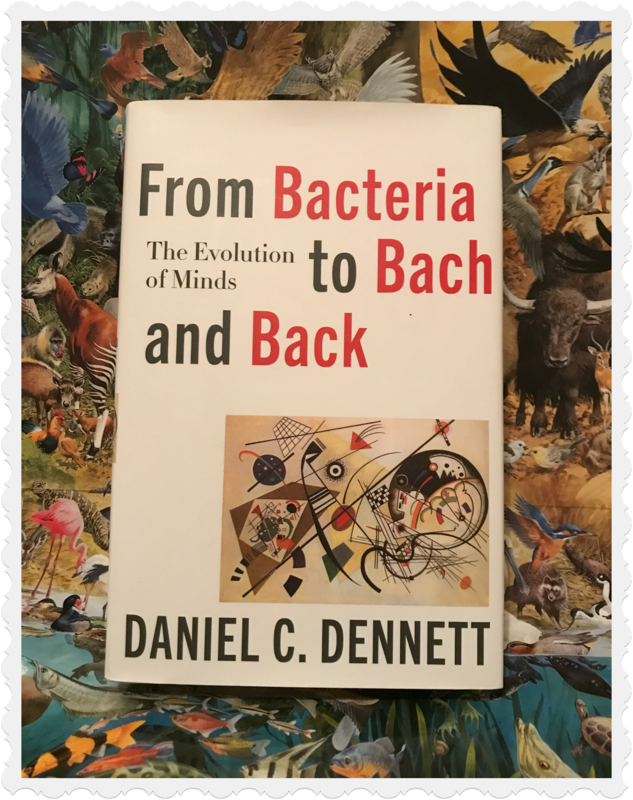 So I was reminded of the message in the pages of From Bacteria to Bach and Back: The Evolution of Minds (W. W. Norton & Company) by Daniel C. Dennett by how Plato And The Nerd takes on ideas that are at least as weighty—and probably far more consequential—as those in Hackers & Painters. Dennett’s book is richly dense in metaphor and analogies, quite often thought-provoking. He is wide-ranging in unfolding the narrative, and linguistically clever. In other words, this book is vintage Dennett. The central artifice that Dennett has used for fathoming intelligence and minds is the notion of memes ala Richard Dawkins. Dennett takes a deep dive into the co-evolution of genes and culture through memes, arguing that this very co-evolution is what makes the human mind unique. There is no question in my mind that humans are coevolving with computers. If computers and software form organisms, then they depend on us for their procreation. We provide the husbandry and serve as midwives. In exchange, we depend on them to manage our systems of finance, commerce, and transportation. More interesting, the machines make the humans more effective at the husbandry that spreads the software species… Compilers translate human-readable code into machine-readable bits… And software innovations fuel the startup culture of Silicon Valley, where the software survives and evolves only if the company survives and evolves, and vice versa (italics mine). Plato recognized that the ideal truths of Forms could not be fully known by humans. 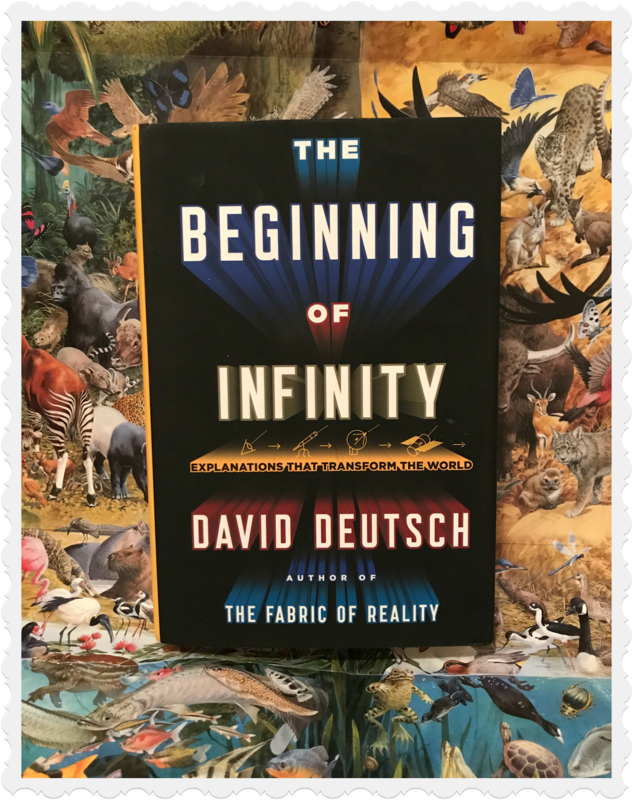 But because they cannot be fully known by humans, isn’t it more practical to view what we do know about nature as human-constructed models or what Deutsch calls good explanations? This would be more humble, tacitly acknowledging that even our most fervently held beliefs about nature are subject to improvement. I’m not saying that there are no truths, but just that we should always be required to question them. 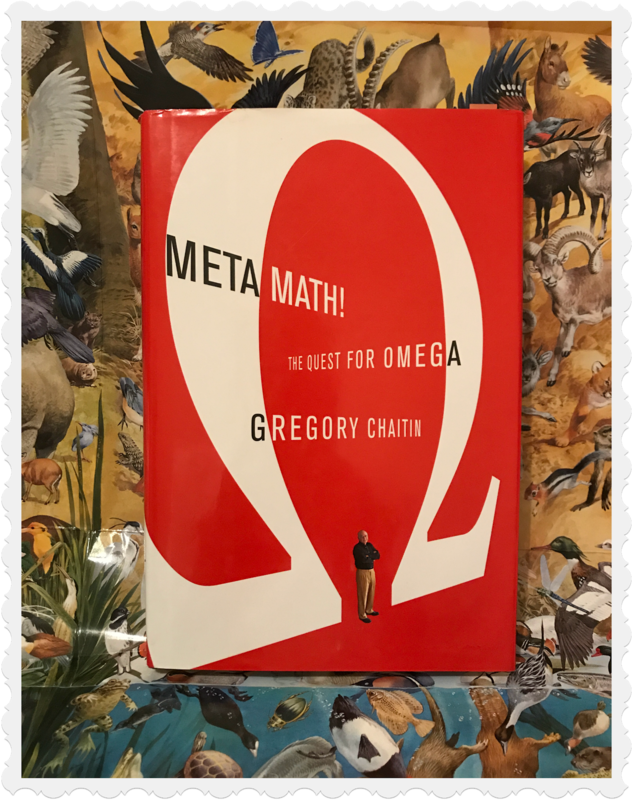 So I was reminded of the message in the pages of Meta Maths: The Quest for Omega (Atlantic Books) by Gregory Chaitin by how Plato And The Nerd takes on the idea of the impossible becoming possible. Chaitin’s startling discovery, the Omega number, is a remarkably complex representation of unknowability in mathematics. His investigations shed light on what can ever really be known about the universe. Period. Interesting stuff! Gregory Chaitin, an Argentine-American mathematician who worked at IBM in New York and at the University of Auckland, New Zealand, developed a beautiful example of such a number, one that he called “Omega,” or Ω. Ω is a number between zero and one whose binary representation can be used to solve Turing’s halting problem for a particular binary encoding of Turing machines. Specifically, if we know the first N bits of the binary representation of Ω, then we can determine for all valid programs of length up to N bits whether they halt. Because this question is known to be undecidable, no computer program can give us any arbitrary bit of the binary representation of Ω… Semantics is an association between a set of syntactic objects, such as bit sequences, and a set of concepts. Numbers are concepts, so one possible semantic interpretation of a sequence of bits is as a binary number (italics mine). “…then it began…” Do you know that feeling? Can you point to a single moment in your life and say: “…then it began…”? Was there a single event that changed the course of your life and eventually led you to pick up this book and start reading this foreword? I was reminded of the message in the pages of Gödel, Escher, Bach: An Eternal Golden Braid (Basic books) by Douglas R. Hofstadter by how Plato And The Nerd spins a tale—weaves a web—as did Gödel, Escher, Bach: An Eternal Golden Braid. And what a marvelous tale there is in the telling and gelling of the themes that run free and unite into a coherent whole between the two covers of Edward’s Plato And The Nerd. But it sure feels nice. Gödel, Escher, Bach: An Eternal Golden Braid, of course, needs no introduction. In fact, you’ll find plenty of reference to it through the length and breadth of the vistas covered right here on this blog community we know as Programming Digressions. It’s truly a wonderful exploration—with Hofstadter digressing willingly at the drop of a hat to weaving a bunch of themes into a unified fugue—of fascinating ideas at the heart of cognitive science (meaning, reduction, recursion, etc. ), and I encourage you to check it out. I won’t explain how Gödel proved his theorem, although it’s an interesting subject. I’ve already risked losing too many readers. If you are interested in understanding this more deeply, I recommend Franzén (2005), which is informal and accessible. A more rigorous overview can be found in Raatikainen (2015). 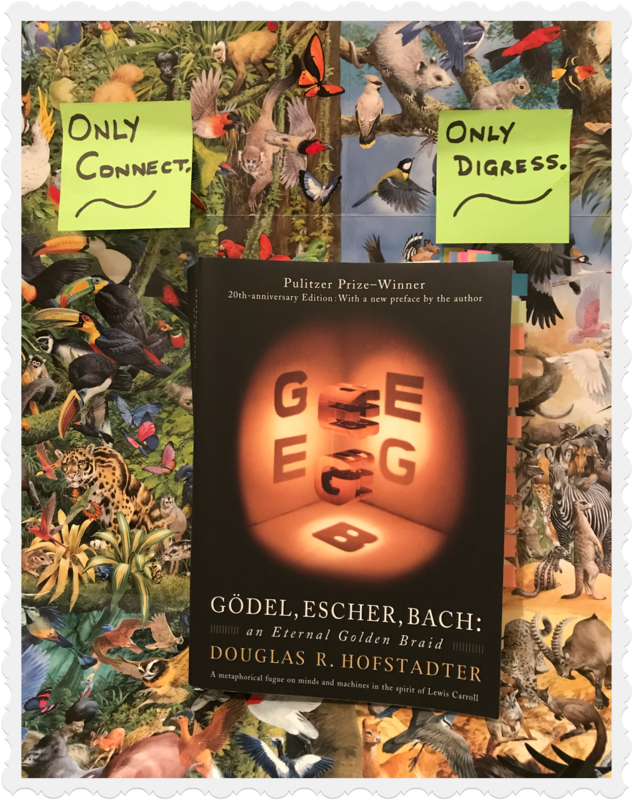 A delightful and witty exposition of the topic can be found in Gödel, Escher and Bach: An Eternal Golden Braid by Douglas Hofstadter (Hofstadter, 1979), which won a Pulitzer Prize. Instead of giving you more detail on Gödel’s theorems, I would like to consider their implications for modeling and software. In Gödel’s formal languages, the set of all mathematical statements and the set of all proofs are countable sets, just like the set of all computer programs. Moreover, a “proof” in a formal language is a sequence of transformations of sentences, where each transformation is governed by a set of inference rules. This is conceptually close to what a computer does when it executes a program. In a computer, the sentences in the formal language are ultimately just sequences of bits, and the inference rules are the instructions in an instruction set architecture (italics mine). Oh, and did you notice the observation—again referring to the brief passage excerpted above from Plato and the Nerd—that was tacked on to the author’s remark about refraining from explaining how Gödel proved his theorem? Hey, I had even made the observation all italicized as a telltale clue, come to think of it 👻 Anyhow, we’re all friends here in the Programming Digressions community of readers, so all good! But the careful reader may have noted how Edward had observed that “I’ve already risked losing too many readers.” (again, italics are mine). My former PhD thesis advisor, Dave Messerschmitt, once told me that when you publish a book, every equation you put in the book cuts your readership in half. I will call this principle “Messerschmitt’s Law,” although Dave tells me he did not discover this law. But I first heard it from him. Throwing caution to the wind, I am putting in an equation, but in an attempt to have some discipline, I will number each equation with an estimate of the remaining readership. Here, I’ve assumed optimistically a starting readership of 8,192, so the presence of this equation has cut it to 4,096. The next equation will be numbered 2,048. These are powers of 2 to make it easier to evenly divide by 2 each time and to underscore that I really am a nerd. If and when I get down to equation (1), I can write whatever I want because I will presumably have no more readers. As a side note, my PhD thesis had several dozen equations in it. It makes me wonder whether Dave ever read it. …Computers can, for example, sometimes prove theorems and symbolically solve mathematical equations involving real numbers. However, software is fundamentally limited to a countable world, and it is limited to processes that are algorithmic, following step-by-step procedures. If the physical world is not so limited, then there are machines that can perform functions that software cannot. I believe it is extremely unlikely that the physical world is so limited; thus, despite the amazing things we can do with software, we can’t do everything, and even what we can do with software often requires a partnership with humans to give it any semantic meaning. Computers are not universal machines (italics mine). Many books explain what is known about the universe. This book investigates what cannot be known. 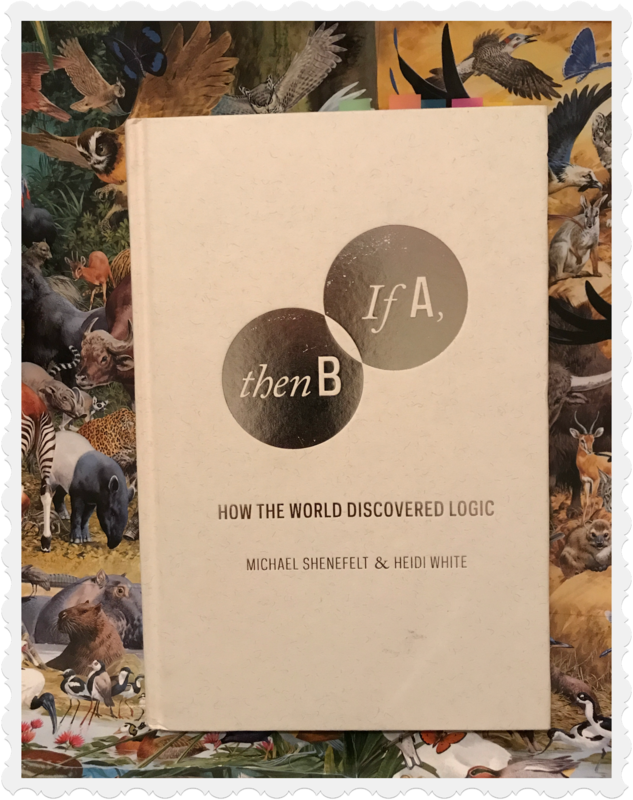 Rather than exploring the amazing facts that science, mathematics, and reason have revealed to us, this work studies what science, mathematics, and reason tell us cannot be revealed. 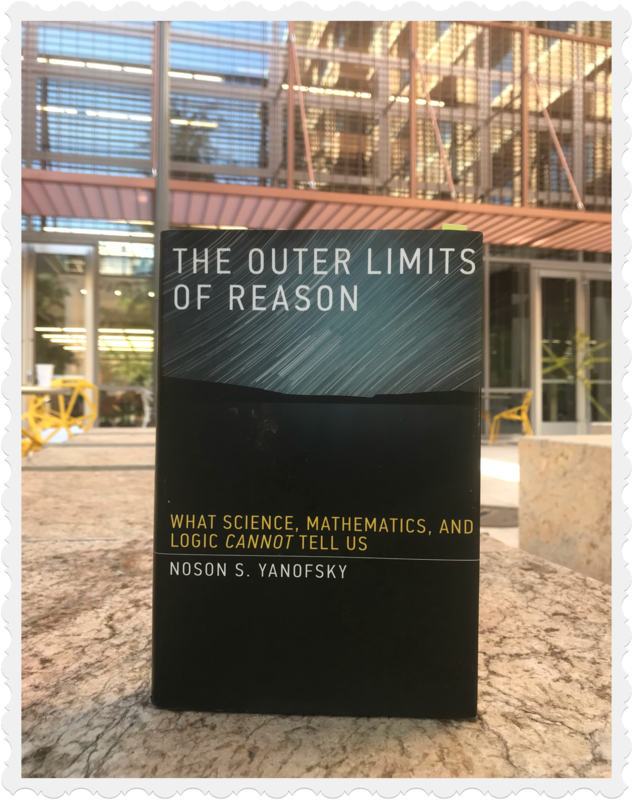 In The Outer Limits of Reason, Noson Yanofsky considers what cannot be predicted, described, or known, and what will never be understood. He discusses the limitations of computers, physics, logic, and our own thought processes. Heaven forbid, did a meteor strike, flattening them all out of existence, leaving behind nothing more than blood and concrete? I mean, all I see in the pic above is my copy of The Outer Limits of Reason: What Science, Mathematics, and Logic Cannot Tell Us (The MIT Press) by Noson S. Yanofsky—bedecked in an ebony dust jacket that’s rather lovely and all the fashion—basking in sunshine outside the Gates Dell Complex (GDC) on the campus of The University of Texas at Austin 🎓 The GDC, of course, is home to the computer science department. · · · in which I argue that models are invented, not discovered; that engineers and scientists use models in complementary, almost opposite ways; that all models are wrong, but some are useful; and that the use of models can slow as well as advance technological progress by establishing a backdrop of unknown knowns, by forcing increased specialization, and by requiring humans to assimilate new paradigms. As I’ve come to learn, you have coauthored several textbooks on topics including digital communication, signal processing, embedded systems, and software modeling. Plato and the Nerd is your first book for a general audience. Please make sure this is not your last 🏄 You’ve got a great thing going. Please ride the wave and keep the momentum going. like a magnificent fringe sewn up under the hem. turns in the lock of your fear. asking where, ku? Where, ku? Where any man or woman goes to cry. Where the sick go when they hope to get well. and, the same moment, sends a ship on its way. 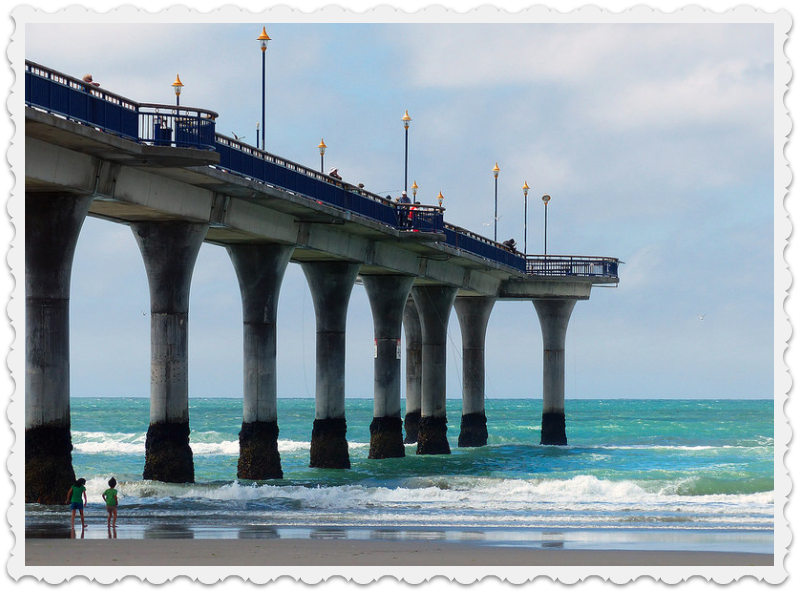 The hope that abides in my collage above is that it’ll inspire and propel you to learn more, to build bridges as far as the horizon of your imagination lets you, and keep going from there!